by ybonesy. All rights reserved. The age at which people marry is the greatest predictor of a failed marriage, so marry late and lower your expectations. 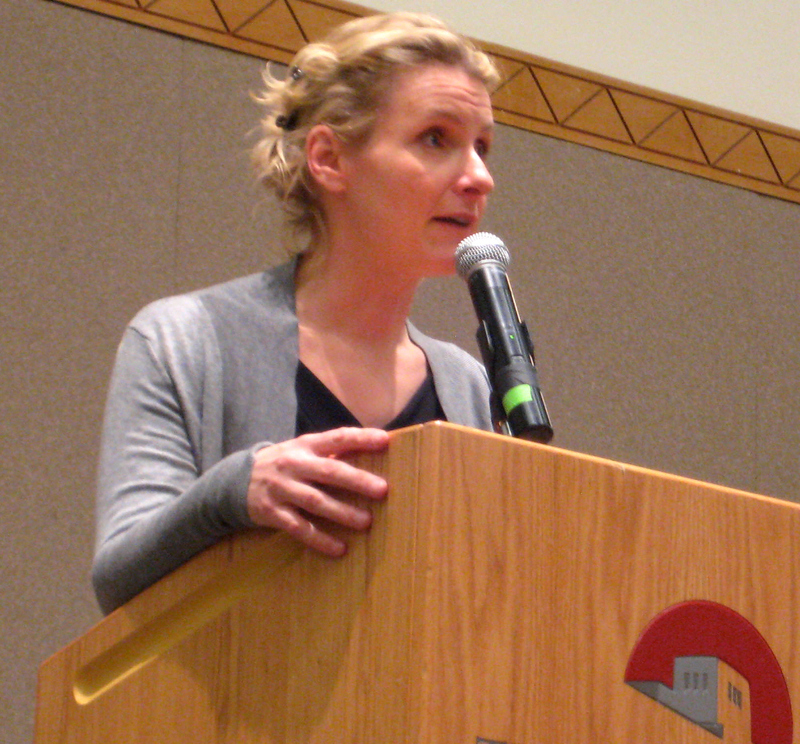 “You almost can’t wait long enough,” says author Elizabeth Gilbert to an audience of about 720 book lovers that gathered in the University of New Mexico SUB ballroom in Albuquerque this month to hear her read from her newest book, Committed: A Skeptic Makes Peace with Marriage. American marriage is supposed to be the safe harbor for soul gratification, life partner, wealth building, child rearing and everyday companion. Gilbert didn’t set out to be an expert on romance and marriage. Rather, the author of the mega-best-selling Eat, Pray, Love set out to be the “bride of writing,” as she proclaims on her Web site, elizabethgilbert.com. She also set out to travel, to do yoga and to recover her heart after a brutal divorce and an even-more brutal breakup in a rebound relationship. That led to Eat, Pray, Love, which took readers from Italy to India to Indonesia, where she met the man she loves and shares her life with, the Brazilian gem importer she calls Felipe in her books. What she didn’t plan on was that her journey would lead her to Committed, released in January 2010. That book opens with the U.S. Department of Homeland Security announcing to Gilbert and her sweetie that their 90-day chunks of commitment — which resembled marriage in every way but weren’t marriage — weren’t going to pass muster. Felipe, an Australian citizen, was in the U.S. on a limited visa that allowed him to stay with Gilbert in their non-wedded state of bliss in Philadelphia about three months at a time. Then, he would have to depart to parts elsewhere, sometimes with Gilbert, only to return. This activity appeared suspicious in the post-9/11 world. Homeland Security announced they would deport him… though a friendly official known only in the book as “Officer Tom” gently advised them that they could solve this problem with the M-word — marriage. “What we determined, quite swiftly there in the bowels of the Dallas-Fort Worth airport was that it would be hugely to our benefit to do this,” says Gilbert. Thus, another journey began — and another book. The route to writing a follow-up to Eat, Pray, Love, was, shall we say, a learning experience. “The notion that we (as writers) are supposed to be defeating ourselves strikes me as cannibalistic and a little scary,” Gilbert says. But she also reminded herself that writers have long careers, and she planned to be writing at least until she was 80. Now 40, she realized that she had 40 more years of writing ahead of her, of which Eat, Pray, Love, would be a small part. It took 500 pages and some time off to shed the mantle of expectations for what her next book would be. She freely admits she rejected the first 500 pages, making the painful decision that she could not turn it in to her publisher, which was expecting a manuscript. She had to take six months off and do something completely different until it became clearer how to approach the next book. That meant a lot of gardening. “Your hands are in the dirt, it’s restorative, and every so often you get a cherry tomato,” she says. One day in the fall, the first line of Committed came to her. It was in a different voice. “The problem with the early draft was trying to write in an imitation of my Eat, Pray, Love voice,” she says. That version of the draft was a completely different way to tell the same story she tells in Committed, which gets us back to what Gilbert has learned about marriage. But Gilbert also had to make her peace with how much of her marriage was public – owned by the government and the community – and how much was private. “It’s not just your own story,” she says. Yes, two people who are in love write their own code, governing the graceful balance of give and take. But their relationship also belongs to the community. And to the U.S. government, as she learned. And to history. “And some would say it belongs to God,” she says in the interview. Gilbert worked through the tremendous expectations not only about marriage, but about her next book. She admits to big time writer’s block. In a 2008 TED lecture on creativity, she wonders why writers put this on themselves. Her father, a chemical engineer, never had chemical engineering block. The newspaper columnist Russell Banks admitted to being lazy and a perfectionist. “I just refused to die as a person who had 30 pages of a novel in her drawer,” she says. Carolyn Flynn, an MFA candidate in fiction and creative nonfiction at Spalding University, has seen her literary short stories published in Ellipsis and The Crescent Review, as well as the German anthology Wilde Frauen. She is the winner of the Renwick-Sumerwell and SouthWest Writers fiction prizes and has been short-listed for the Tom Howard Prose Prize in creative nonfiction and the Danahy Prize in fiction. For the past ten years, she has been editor of SAGE magazine, published monthly in the Albuquerque Journal. The author of seven nonfiction books on body-mind-spirit topics, she lives in Albuquerque, New Mexico, with her 10-year-old twins. Carolyn also wrote red Ravine posts An Evening With Elizabeth Gilbert & Anne Lamott after seeing the two writers together in 2008 on the UCLA campus and The Devil Came Down To Austin about seeing ghosts of her father while attending the 2007 Agents & Editors Conference. You can find out more about Carolyn at carolynflynn.com. Carolyn, what a fun way to share the gems of wisdom from Elizabeth Gilbert. I thought her blend of tidbits on both love and writing were great. It seemed like there must have been quite a few writers out in the audience, as there were so many questions about her writing process. I was especially inspired by her words about not wanting to die with 30 pages of a manuscript in her drawer. In fact, after listening to Gilbert I took out a 20-page short story that I’ve not managed to get published–admittedly I didn’t try hard enough the first time nor was it polished enough–and am submitting it now to several literary journals that run Spring fiction contests. I wonder if writers know just how much their words motivate us. Interestingly, my short story is about marriage and divorce and trying to understand the seemingly fine line that separates one from the other, especially in marriages that aren’t about big flaws (like addictions or abuse) but rather those small incompatibilities that most couples confront. Really loving this topic right now. I wonder why it seems so timely? I mean, not only that it’s Valentine’s Day today, but right now, this time in history. Any thoughts on that? I should also say that Carolyn introduced Elizabeth Gilbert at the UNM Sub Ballroom, and Carolyn’s introduction was witty and touching. I was sitting one seat over from Gilbert as she waited to go up onto the podium, and at one point she let out a guffaw and turned to look at me like, This is funny stuff! But also the way you warmly welcomed Gilbert to Albuquerque. I do think we, as a culture, are giving a lot of thought to marriage right now, and not just because yesterday was Valentine’s Day. I’m amused that one of the most-promoted new TV shows coming up is “The Marriage Ref” with Alec Baldwin, Jerry Seinfeld and Kelly Ripa. I think we’re coming around to the idea that marriage is not a disposable lifestyle — that unless there are big, big issues like addictions or abuse we need to act like big-time grown-ups and be more compassionate and less controlling about those incompatibilities. We’re all incompatible, on some level. It’s interesting to me that married people are this country’s newest minority — only 49 percent of adults are married in this country. Most of us are coupled, but not necessarily married. The institution is in a state of flux. And these dialogues are coming up at a time when — it’s now official — the balance of power has changed in gender relationships. It’s been the case for a long, long time that real-life American marriages are not constructed solely by gender-defined traditional roles. Only 22 percent of women in America are in the stay-at-home mom role, and among those, many have careers or businesses, and for many of those women, it’s a stage of life. They have come to that role after building a career, and they’re taking time out, or they will end up starting a business once their children are older or in college. Plus the latest stats show the ranks of stay-at-home dads are growing significantly, especially with a “man-cession” going on. So let’s stop defining marriage by who does what and define it instead by who loves who. I’ll add that I think we’re beginning to treasure the long view — loyalty, constancy, faithfulness. I had to smile reading your review. I waited until I was 45 to marry because I was afraid of failure. I married my best friend and am now living my “happily ever after” and getting ready to celebrate my 5th anniversary. Your words ring true for me! Thanks, Carolyn. Gloria Steinem married her best friend, too. She basically remodeled the institution of marriage, and then she moved in. The part of Committed I finished reading yesterday was interesting. In it, Gilbert goes into depth on her flaws and Felipe’s flaws, and on their incompatibilities. They are such very different people, beginning with one being an extrovert (her) and other an introvert (him). She mentioned that Felipe was not the kind of guy who would stroll with her through a Farmers Market, for example. Several other pretty big differences. Of course, opposites do seem to attract. Jim and I have some big differences, especially around our views of body-mind connection. Those seem to be the biggest area where our different philosophies lead to marital discord. But we also land on the same side of several fundamental areas: politics, religion, kids, land, gender bending (he’s not traditional in terms of what women do and what men do in the house and in work). On extroversion and introversion, I used to think he was the latter, but the truth is he’s quiet but very much into being around people. And with people he knows, he’s very talkative. I was also surprised to find out how much he loves to shop around in antique stores, for example. Doesn’t like to fly; that’s a big difference between us. But the more people I talk to, the more I meet who hate to travel by plane, especially long trips. I think the marrying (or partnering) at an older age thing has to do a lot with the expectations thing. We’ve gone through enough different types of relationships–love, work, kids, family, friends–to know that there are very few where discord is absent. I agree with you about waiting for maturity before marrying — to a point. I think you can wait too late, that you can get too set in your ways. Flexibility and tolerance are much-needed attributes in any candidate for marriage! People who marry when they are young can grow together, and that can be a very rewarding experience. The trick of it seems to be that you have to burn off a lot of your selfishness before you’re a prime candidate for marriage, and if you can get that nasty business of self-exploration out of the way, if you can somehow go off to Italy, India and Indonesia, for instance, you can be a good partner for someone! Carolyn very nicely done, I do agree with her point about managing expectations, it is one of the biggest pitfalls I have encountered. You know my current situation won’t allow too many positive feelings about marriage right now. But having tried it all the different ways Elizabeth suggests, young vs old, heat vs love etc. I’ve come to some different conclusions about marriage. One of which has to do with the whole public ritual and ceremony that takes place before the marriage even begins…but I have many issues that can only be satisfied with serious prescription drug use! The essential problem is that we excel at romance when we’re young, and at the same time, we’re deficient in maturity. When we’re old we’re too wise to be swept up in the heat of romance. Is that sad? I’ve seen life from both sides. I’ve had my thrills and agonies. But I also am enjoying the even keel. It’s nice to temper it with a touch of wisdom. Coming back to this great post from Carolyn to drop in a link. I listened to these two rebroadcast interviews on MPR yesterday. Fascinating to listen again with the new movie coming out. If anyone has seen it, I’d love to know what you think. With “Eat Pray Love” (no commas intended), the film starring Julia Roberts, currently reaping millions at the box office, Midmorning rebroadcasts two conversations with author Elizabeth Gilbert about her literary adventures.